Last year I was asked to meet with Richie Clayton and Richard Herbert who had a really interesting idea for an international golfing website. Richie is a businessman who is an avid golfer and runs his own golf society. Richard is a professional golf pro based near Swansea. Together they make a good team and their idea of a ‘One Stop Shop’ for golfers was intriguing. They had identified a gap in the market and had some really great ideas for their new website business. Over the months we worked together and gradually Generation Golfer was designed and built. 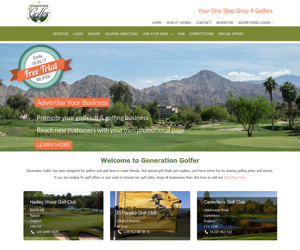 This unique website offers golfing fans around the world the opportunity to meet new friends using their own social networking platform, share jokes and fun stories and they can also search for special offers and browse golfing suppliers. The website was launched in the Autumn 2016 and it’s growth has been outstanding. Within a week of it’s launch the traffic was so high that it had to be moved onto a dedicated server. Each month the website attracts more visitors and enquiries from around the world. We are continuing to work closely with Generation Golfer as they have exciting new plans to develop the business further in 2017.